Seeking talented electrical engineering technical leadership in a System Architecture team. The position is as a highly cross-functional individual contributor design engineer and systems architect. The ideal candidate has core competencies in several functional areas of responsibility and system design and computer architecture. 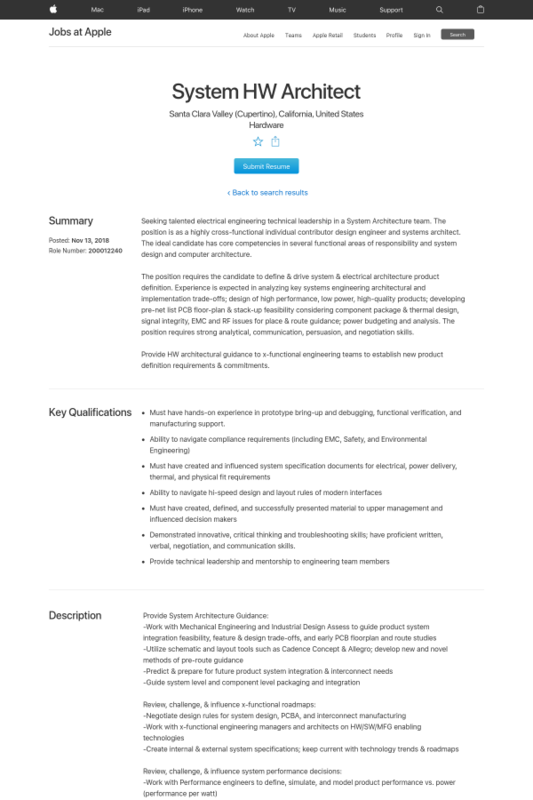 The position requires the candidate to define & drive system & electrical architecture product definition. Experience is expected in analyzing key systems engineering architectural and implementation trade-offs; design of high performance, low power, high-quality products; developing pre-net list PCB floor-plan & stack-up feasibility considering component package & thermal design, signal integrity, EMC and RF issues for place & route guidance; power budgeting and analysis. The position requires strong analytical, communication, persuasion, and negotiation skills. Provide HW architectural guidance to x-functional engineering teams to establish new product definition requirements & commitments. Must have hands-on experience in prototype bring-up and debugging, functional verification, and manufacturing support. Demonstrated innovative, critical thinking and troubleshooting skills; have proficient written, verbal, negotiation, and communication skills.